An in-depth review of Newfoundland’s most remote hotel. 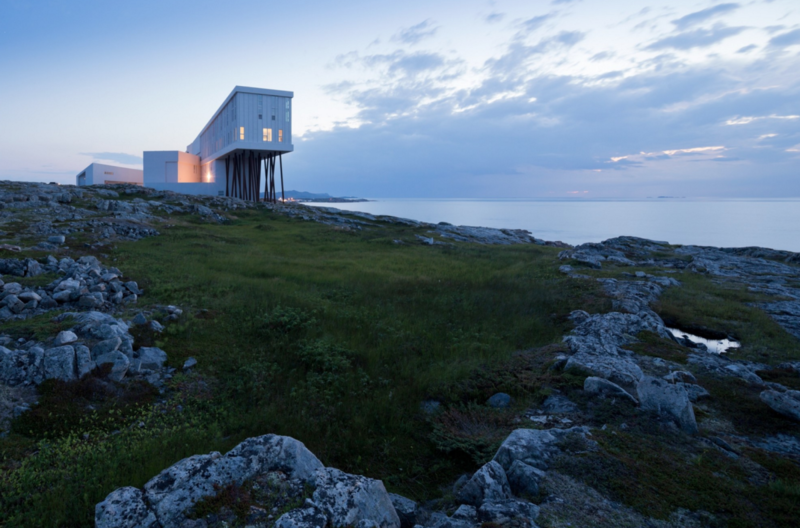 Most people don’t know of Fogo Island, even fewer have been. 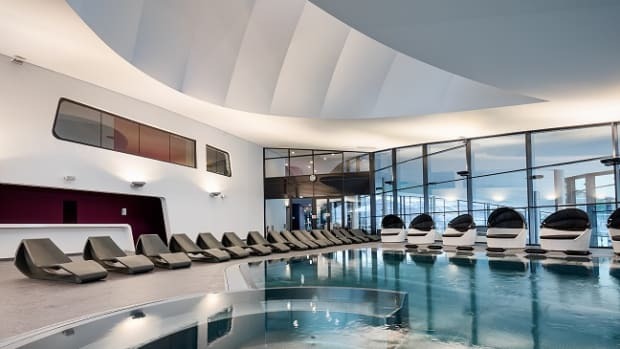 Those who do know it may recall an image they saw online of a luxury hotel, flaunting modern angles and sharp edges, perched on a rocky shore. 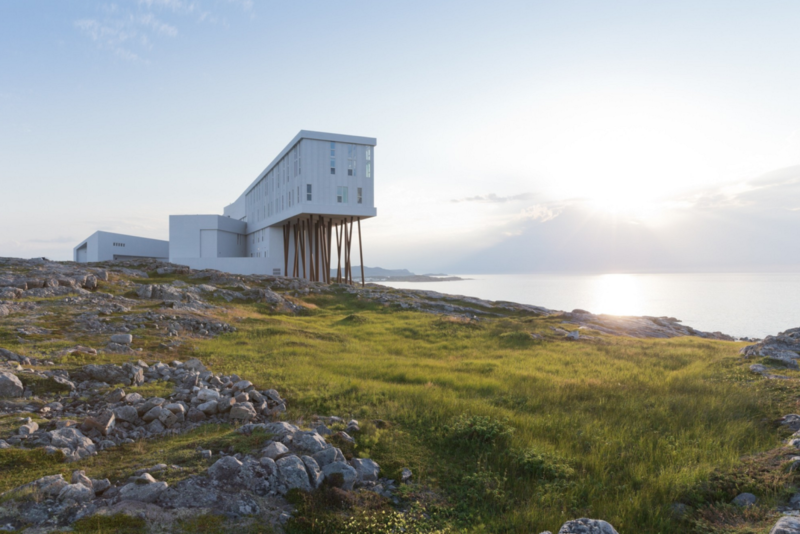 Complemented by four artist studios designed in the same style by the same architect on the same island, the strange structure is Fogo Island Inn. Those who have visited will likely describe it as a genuine experience where beautiful scenery, art and hospitality come together in a way you’re not likely see anywhere else in the world. Located off the north coast of the already-remote island of Newfoundland, the subarctic island is home to about 2,000 tough inhabitants, nearly all of them deeply rooted in local ancestry. Fogo Islanders are extremely proud of the distant landmass they call home and, perhaps due to the relatively few visitors they receive, exceedingly hospitable. It’s hard not to notice this the instant you enter the Inn, greeted by a staff who can’t seem to stop smiling. Complemented by the lobby hearth’s seemingly everlasting flame, that warm welcome truly resonates after the exhaustingly long haul it can take getting to the Inn, which will likely involve at least two flights, a rental car and a ferry crossing (private charters are also an option). Depending on where you’re coming from, you may pass through St. John’s, North America’s easternmost major city­– consider spending a night at the highly recommended JAG Hotel to break up the journey. Make no mistake: All the planes, trains and automobiles are worthwhile, as all your travel anxiety will evaporate the instant the Inn’s unmistakable and almost-unnatural white form comes into view. 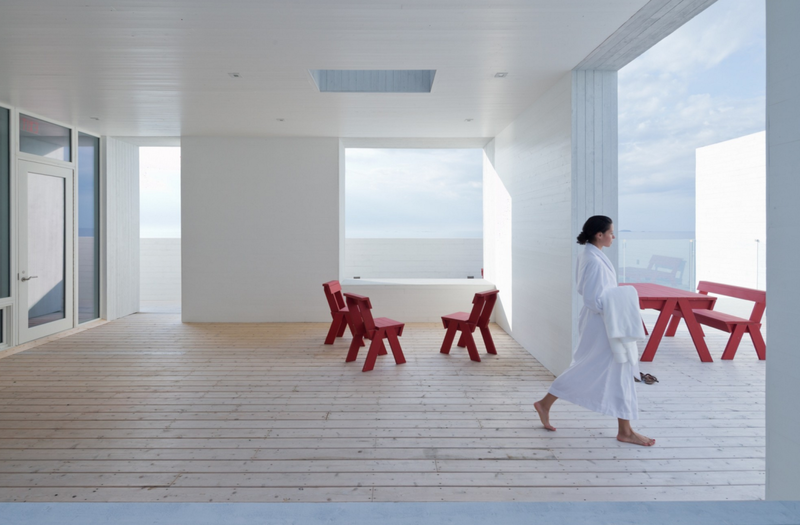 Fogo Island Inn was designed by architect Todd Saunders, who was raised in the nearby city of Gander but has since relocated to Norway, a transition very evident in his elegant Scandinavian-influenced touch. His world-class recognition, local background and sophisticated style are evident throughout the hotel, which both reveres its environment and represents the apex of modern hospitality. It’s homey yet without a trace of the cold starkness that often accompanies contemporary design. Saunders’ team accomplishes this balance by sourcing local materials whenever possible, offsetting the Inn’s angularity. All of the exterior’s bold white lumber comes from the island, and the furniture in all 29 rooms was hand-made by Fogo Islanders. The tactile elements – the door hardware, the room keys even the baskets full of tea and scones delivered to your door every morning at sunrise – may look strange at first, but they feel utterly familiar. Those sunrise treat baskets, referred to as Daybreak Service, are part of the Inn’s standard Full Board package, which includes, among other amenities, all meals, a personal guide for a half-day island orientation, bikes, gym and, should you need the wood stove fire in your room lit, an always-available staff member. It’s this level of foresight and attention to guests’ needs that makes everyone’s time at the Inn an incredibly relaxing experience. Apparently it’s not at all uncommon for guests to tear up on arrival when they recognize how emotional it can be to completely shrug off responsibility from the outside world. 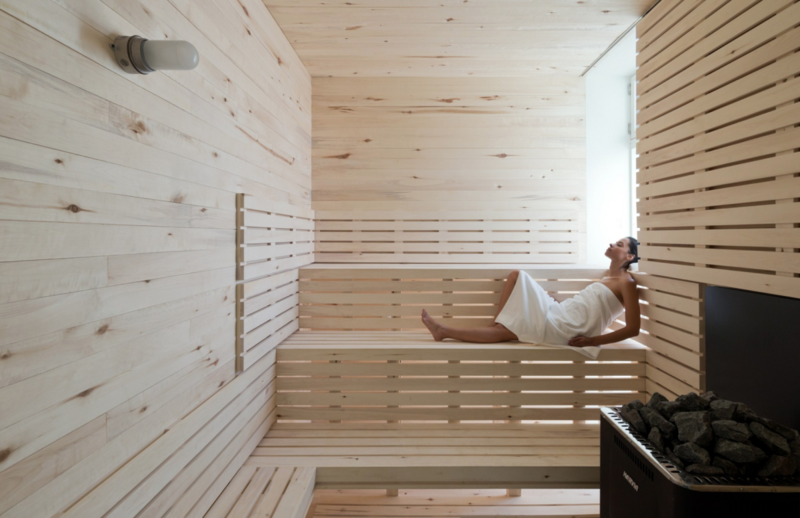 The rest of the hotel’s amenities like the rooftop hot tubs, art gallery, library, cinema and top-notch restaurant make it difficult to justify ever leaving the small premises. 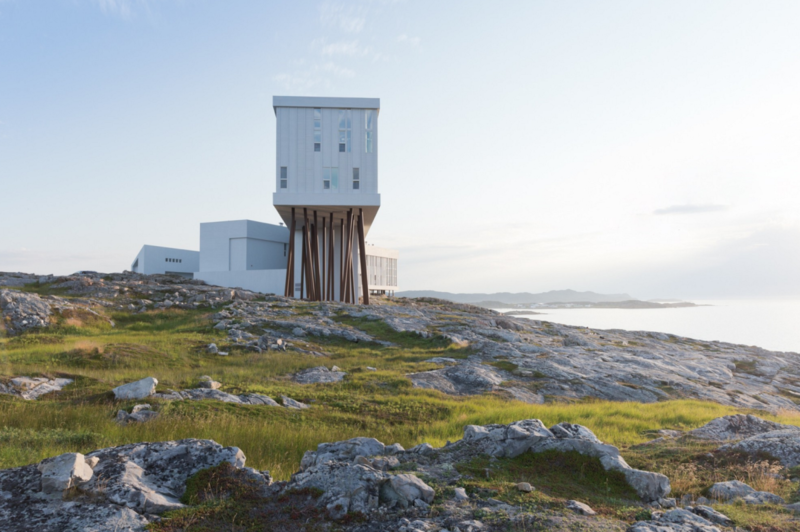 But taking the time to explore Fogo Island itself is yet another experience altogether. With only three bars, three restaurants and one main grocery store servicing the entire population, you won’t see a familiar brand name or chain. 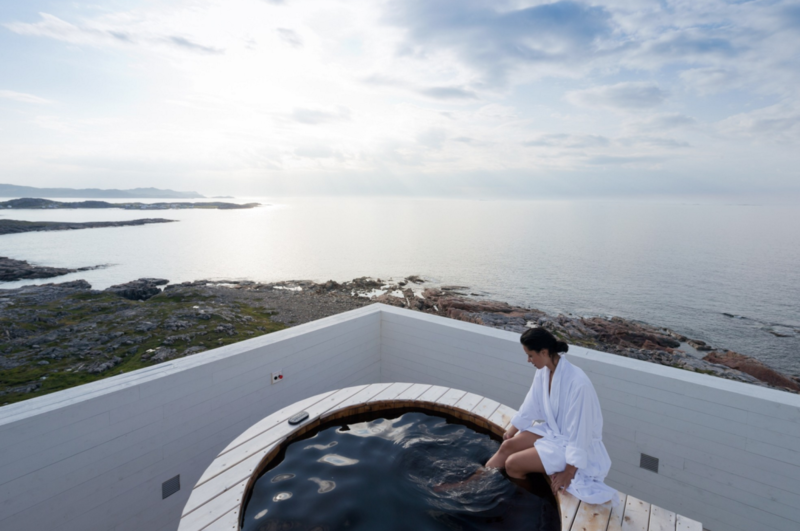 Couple that with the gorgeous artist studios and the otherworldly nature–the bright colors of the sky, the proud herds of wild caribou, the panoramic views from windswept plateaus–and it almost seems like Fogo Island is meant for taking a break from reality. 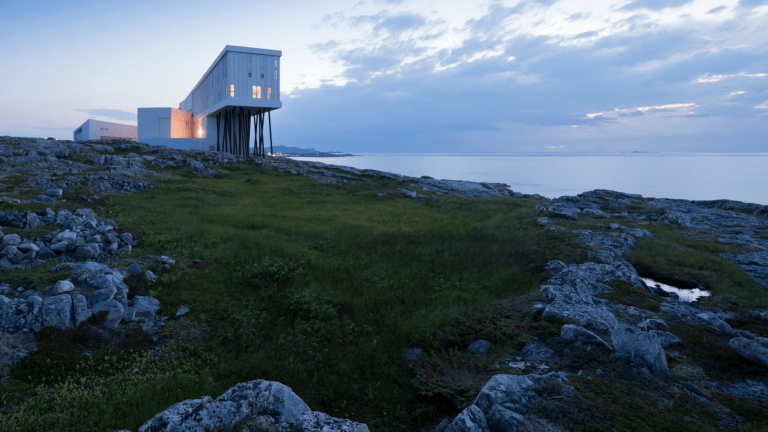 One of the taglines associated with Fogo Island is ‘far away from far away’ and, much like the Inn, the artist studios first appear to have been born of a distant culture or civilization. It’s obvious through their exterior design that they are all connected works, but they each feel special for a different reason, especially after you take the time to hunt them each down. You’ll drive past the Tower Studio, with its long wood plank entry way and its roof deck, on your way to the Inn and you’ll be able to barely spot the Long Studio, which resembles a shipping container when seen from your window at the Inn. 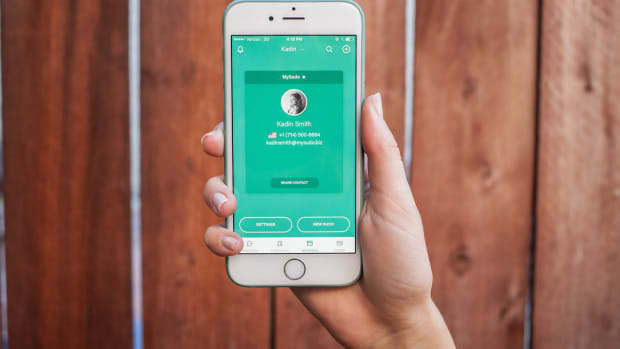 All the rooms offer floor-to-ceiling ocean views, by the way, and the Atlantic’s natural ebb and flow beats any white noise simulator or app. But you’ll have to trek over to a corner of the island and hike into the hills to uncover the Bridge Studio’s lakeside serenity. And the Squish Studio might be the most photogenic of them all when it’s framed by the high tide crashing into the cliffs only feet away. Considering the surrounding landscape, it comes as no surprise that all the studios are totally off the grid, heated by fireplaces and powered by sustainable methods. 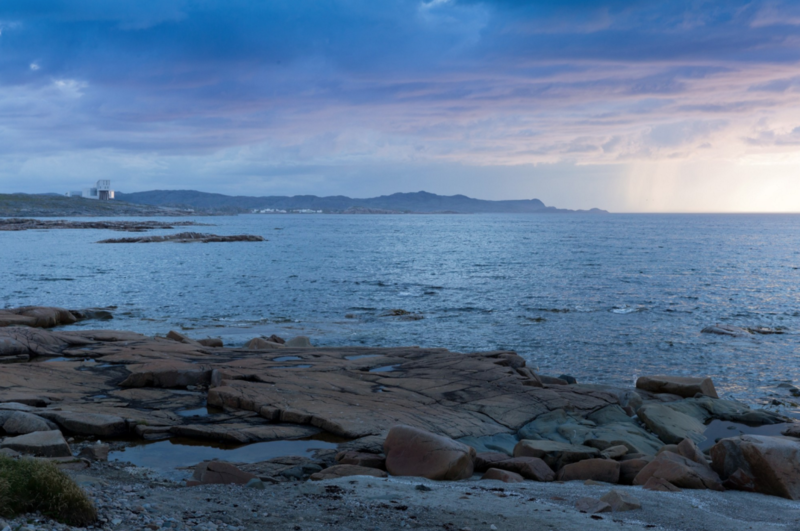 The Fogo Island Arts (FIA) program, a sister organization also run by the Inn’s Shorefast Foundation, places a new artist in each of the studios every 4-8 weeks for a fully reimbursed residency. 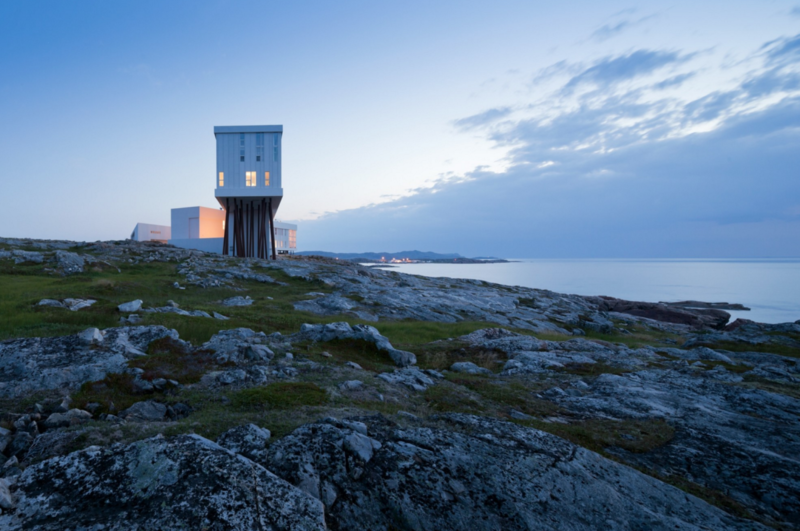 In just a couple of years, FIA has not only placed Fogo Island on the radar of destination resort travelers, but on the itineraries of art experts as well. There’s already talk of building two more studios and an outdoor community swimming pool to teach Fogo Island children how to swim (the ocean is too cold to learn so several Fogo Islanders drown every year). It seems like growing the island’s profile is a priority for FIA, but not at the cost of the Inn’s quaint appeal. 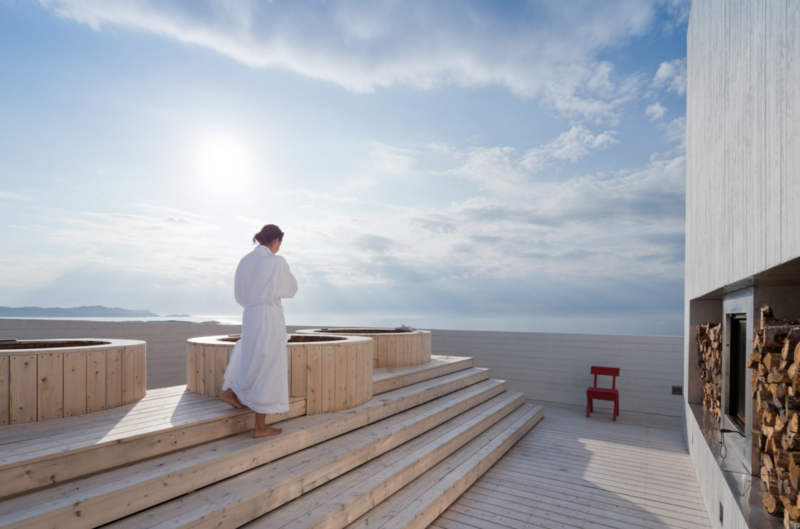 The Fogo Island Inn is at once many different things. It’s severe on the outside yet inviting on the inside. 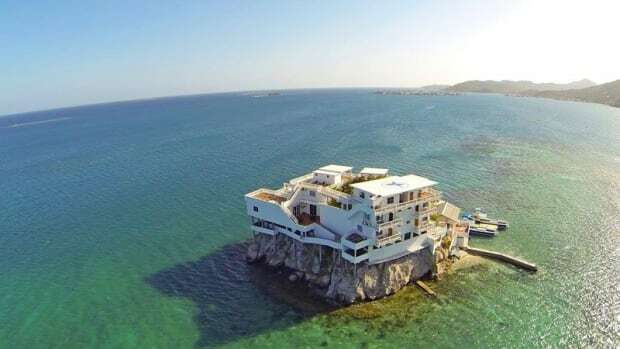 One guest described it as ‘no better place for a honeymoon.’ Yes, it’s also expensive and difficult to reach. But if you want to disconnect from the world while exploring a brand new one, the sum of its parts add up to an experience that’s worth going far, far out of your way for.